In this post, Dr. Nuket Curran, a physical therapist of 18 years, talks about pregnant and postpartum back pain and what new moms can do to feel better and keep going Dr. Curran’s main focus in her practice has been low back pain management, so who better to talk with! If you suffer from low back pain after delivery, Dr. Curran says that’s quite common. Postpartum back pain can be directly associated with hormones that pregnancy and nursing create. In fact, you may still have relaxin, one of the hormones released during pregnancy and nursing, in your body for months after birth and even after you finish nursing. We learned that Relaxin has several jobs during pregnancy and delivery. It preps the body’s tissue for pregnancy then relaxes the ligaments that support the joints to prepare you for delivery. Relaxin ultimately allows your body to stretch when your baby is born. The thing about this ‘relaxing’ process, is that your joints still may remain “loose” until the hormone lowers its production, which could take up to 5 months postpartum. Dr. Curran shares with us a few ways to alleviate postpartum back pain. Stretching, use of heat and ice, along with stabilization exercises will be super helpful in your recovery. For acute or temporary pain, ice is mainly used to decrease the blood flow to the area which decreases swelling – one of the main causes of pain. It also provides a numbing effect, telling the surrounding nerve pain fibers to “simmer down” and stop firing so fast and furiously. The result = less pain. Your main goal in the acute stage of any injury or onset of pain is to calm it down and decrease any local swelling. That’s why ice is so useful in the early days. You should ALSO keep moving through the pain, but in a sensible way. Applying ice as often as possible will help decrease the pain as you begin strengthening. Wearing a Recovery Wrap, for example, enables you to keep moving which is essential. After the initial 72-hour period, you can opt for ice or heat to create blood flow and also provide pain control. When you apply heat, you increase blood flow to the tissues which allow them to become more relaxed. Dr. Curran reminds us that pain tells the muscles to stop firing because something is not working right. A dysfunctional muscle cannot help support a sore back! Postpartum back pain can actually shut down abdominal muscle activity which is why it is so important to keep moving. 1. Don’t Sit With Your Legs Crossed: Sometimes this can cause slight rotation of the pelvis (Sacroiliac joint) causing pain in the low back or tail bone. 2. When Lifting, Keep Your Spine Straight + Bend Your Knees: When you bend your spine, you’re stretching your back muscles which causes them to perform less effectively. Form is everything! 3. Whatever You’re Lifting, Make Sure it’s Close: Whether you are lifting your wriggling toddler or a heavy, you want to decrease the amount of force you put through your joints. 1. Zip Up Your Ab Muscles: Your abdominal muscles have separated during your pregnancy to accommodate for your growing baby. In postpartum, however, part of your recovery is to learn how to tighten these muscles back up. Otherwise known as tightening your pelvic floor, this is much like doing kegels for your abs! When practicing, focus on drawing in your belly button while tightening your abs. Dr. Curran starts these in a kneeling position (see below) so gravity can help draw your lower abdominal muscles up and in to “zip up”. 2. 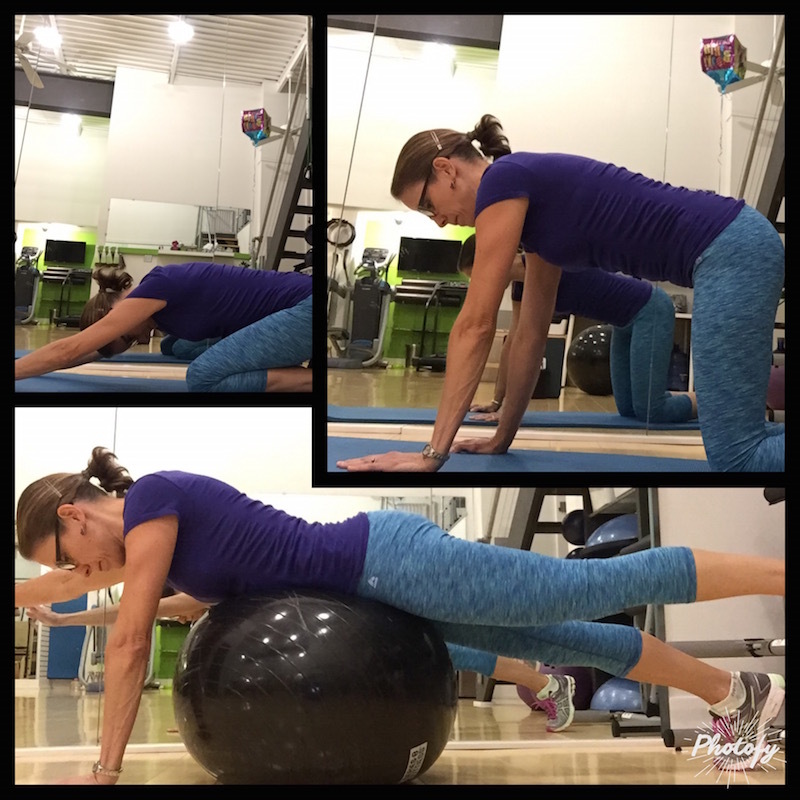 Modified 1-Legged Bird-Dog: Lay with your stomach on an exercise ball and turn “on” your ab muscles. While keeping your abs contracted, slowly raise one leg at a time off the floor. Start with 10 per leg and build up to 3 sets of 10. As you gain strength, try raising the opposite arm at the same time. 3. Child’s Pose Stretches: This typical yoga stretch is a nice transition from the position in #2. Remove the ball from your stomach, sit back on your heels while allowing your knees to spread apart. Allow your arms to fully straighten out above your head. Stretch for at least 30-45 seconds. Above are just a few of the exercises you can do for postpartum back pain relief. Dr. Curran also demonstrates these positions in this video. (Note: If you attempt the activities above and feel significant pain, do not continue. Ask a physical therapist for additional guidance and/ or an evaluation to determine if your postpartum back pain is due to something other than instability. Dr. Nuket Curran, PT provides individualized outpatient therapy in Pittsburgh, PA. You can contact her through her website or email if you have any questions about this post or postpartum back pain.